This is the largest Philippine hornbill. It is a Philippine endemic. It is supposed to be common, but it was difficult to see. We saw it for the first time in Sierra Madre. I saw it fly over while I was photographing the Mangrove Blue Flycatcher. There are three races hydrocorax found in Luzon and Marinduque; semigaleatus found in Biliran, Bohol, Buad, Calicoan, Leyte, Panaon and Samar; and mindanensis found in Balut, Basilan, Bucas, Dinagat, Mindanao, Siargao, and Talicud. We saw it again in Surigao del Sur. We were at the their number one tourist destination, the Tinuy-an Falls. It was raining very hard and it didn't seem likely that we would see any birds. I left my camera in the van and Tonji brought down his small rig. We were sitting around by the falls near the registration office with Bislig Vice Mayor Conrad Cejoco when we saw what looked like a family of Rufous Hornbills in the tree tops! Great views! We saw this bird again in Camp Sawa in the Sierra Madre range but did not get any photographs. 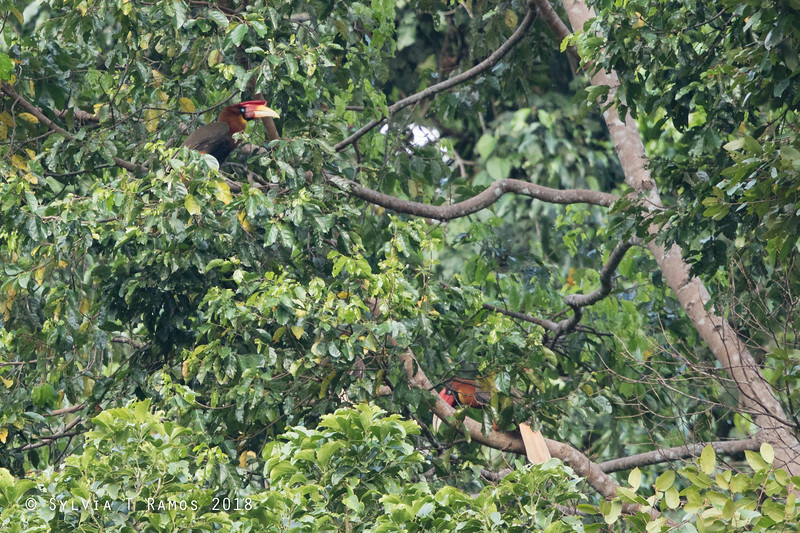 In 2012 we went back to Bislig and got some pictures of the Hornbills in flight. In 2014 we saw them in Adams, Ilocos Norte and in Samar. In the IUCN and BirdLife bird lists, Rufous Hornbill has been been split into two species: Southern Rufous Hornbill Buceros mindanensis found in Samar, Leyte, Bohol, Panaon, Biliran, Calicoan and Buad (race semigaleatus), Dinagat, Siargao, Mindanao (plus Balut, Bucas and Talicud) and Basilan (race mindanensis; Collar et al. 1999) and Northern Rufous Hornbill Buceros hydrocorax found in Luzon and Marinduque. IUCN conservation status of both species is vulnerable.